Lester Kimball took cover before most of his home, above, was swept away by an EF-2 tornado Feb. 28 in Harveyville. 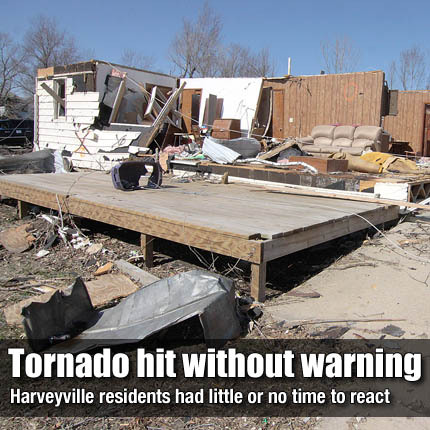 HARVEYVILLE—Severe Weather Awareness Week is March 12-16, but area residents and responders got a crash course in Mother Nature’s wrath when the season sprung up with a deadly tornado that touched down at 9:02 p.m. Feb. 28 one mile southwest of Harveyville. Severe thunderstorm warnings were issued, which carry the threat of wind, hail and occasional tornadoes, but sirens and other direct warning of the impending storm were ineffectively late or altogether absent. The approximately 250 residents of Harveyville had little expectation of what was about to happen. Kimball described the sound of the winds of the EF2 tornado as it ripped the walls and roof from his home. Just seconds before, the storm had descended directly on top of a mobile home on the west side of town. The family that was inside didn’t have time to escape to safety, riding out the storm as it littered their home across Harveyville Road. The two adults and two children huddled within were able to walk away, cold and shaken, but unscathed. They found their way through the dark by the sound of voices belonging to relatives who lived nearby. East of Kimball’s home, Heather and Brian Norton, 383 Wabaunsee Ave., also had just seconds to respond to the storm. “I was actually taking stuff down in the basement because I’m scared of storms anyway,” Heather said. “My husband said, ‘be quiet,’ and we heard the roaring sound. All of a sudden, everything started moving. The roof started coming off and I could feel the wind. The Norton’s daughter is disabled, and was unable to walk or reach shelter on her own. The tornado ripped holes in almost every part of the Norton’s home, removing the roof from the south side of the house. The structure, however, remained intact. Next door, the Harveyville United Methodist Church lay in ruins. Where the sanctuary once stood, only the floor remained. The church’s piano, pews and hymnals were scattered around the property. The tornado traveled downhill to the east, damaging homes along the way before removing the home of Diane and Richard D. Slade from its foundation. Richard, 53, was caught between the house and foundation while trying to reach the basement, and died the next day from injuries suffered that evening. The storm destroyed a four-unit apartment building before leaving town, leaving a wake of damage that extended three miles into Osage County. In addition to one death, thirteen residents were injured in the storm; about a third of the population was displaced. The storm passed over the communities in the north part of Osage County before dropping a smaller tornado 11 miles southeast of Overbook. A warning was issued for that storm, which damaged trailers and outbuildings, but caused no injuries.